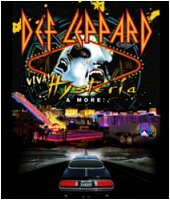 Def Leppard guitarist Vivian Campbell has been interviewed by Glide Magazine about the VIVA Hysteria! residency in Las Vegas. Vivian talked about the setlist and show order for the VIVA Hysteria! residency, playing of songs from the 'On Through The Night' album, re-learning 'Hysteria' songs, staying in Las Vegas, recording/writing new music, possibility of an acoustic segment, joining the band in 1992, growing up in Ireland, musical influences, Last In Line tour plans and recording a new solo album. The now 11 show run is 18 days away and kicks off on 22nd March at The Joint. "Well, aside from doing the Hysteria record in sequence, we are actually doing two sets. The first set will be obviously nothing from Hysteria but we're going to try to make every night different, even if it's only by one song. During that first set of the evening we will be getting obscure. If we follow through on what we've talked about, we'll actually play songs that we've never played before, like real obscure stuff, like from the first album and whatnot. So that'll be interesting, that'll be exciting." "So with the other four days, even though we do have other commitments around those four days, our plan is to actually try and write one or two or three new songs on those days off and that's probably the most exciting thing about it."